I bought this handvac over 7 years ago and about a year ago, I noticed the charge wasn't as good and declining. I then read the reviews here and found the one about the battery charger that someone wrote earlier. I have another B&D handvac with a "good charger base" so I switched the vac to that one to charge and "voila" the vac performs fine. By the way, Black and Decker's website does sell replacement charger units for this for $12.58 (charger unit and base). Besides the charger issue, this is one tough handvac that cleans easily, the nozzles and the filters [but not the motor fan unit] can go into the dishwasher). My older unit had a filter that is plastic and not paper so I can't describe what comes in the new versions of this vacuum. Decent vacuuming power that picks up almost anything dry that kids regularly spill on the floor. I big thanks to the party that did the electrical test on the charger for all of us. Before I buy the new charger, I am going to check the non-functioning charger unit to see if the contacts with the handvac are clean and making contact but if that isn't the case, I'm buying the replacement charger to save a couple of bucks with a perfectly good handvac that seems to work fine now. I haven't found a website yet that sells a replacement battery but that might be too expensive and push me over the edge to just buy a new handvac. Junk, not made to last! My Dustbuster lasted a whole two years, but the last year it would only work for 3-4 minutes before the charge ran out. I found myself running like a maniac to quickly clean up a mess before the battery ran down. It also has low suction, so heavier things like sand don't get sucked up completely. This is one of several Black & Decker appliances I have been dissappointed with in the last few years. From the product lifespan, to the lack of customer service - they aren't the same company my parents loved. 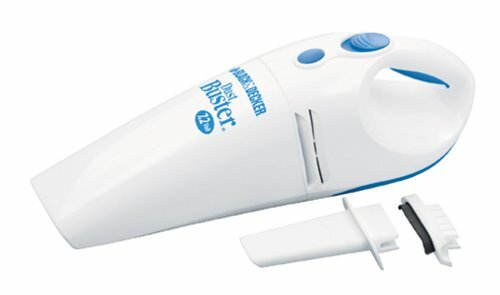 My mother had one of the earliest dustbusters which lasted 10 years, and charged like a champ. Oh well. I too owned this particular model, and by pure chance, so did my neighbour. Mine stopped working after 6 months, in which I followed the directions and kept the unit clean. My neighbour's stopped working after 8 months. Instead of throwing them away, (there were no service centres nearby, and B&D's shipping charges were insane) I took my tester out to see where the trouble might lie. Much to my surprise, there was no power reaching the charging base of the Dustbuster, so I immediately focused my attention on the charging unit. I separated the wires from the charging base and put the tester to work. Sure enough, there was no power coming out of the charger! The verdict? It wasn't the BATTERIES after all, it was a defective charger. (just like the other reviewer said). Another piece of Dustbuster junk. I got sick and tired of all these folks whining about the battery issues. Getting a Versa Pack or any other hand vac with removable batteries is NOT the final solution. What you're doing is making the manufacturer rich from buying their battery packs. There's nothing special about the rechargeable battery in this vac. It's a 7.2V NiCd "pack" - you could grab six NiMH AA batteries, solder them in series, and it'd work the same. We used to have a problem with charging cordless drill batteries as they'd start to not charge up after a year. You COULD buy a new drill or replacement batteries, but you could also "boost" them. I'm not going to post the procedure for this, as it should be left to professionals such as electrical engineers (electricians and technicians are ok too, but EEs that have hands on experience are preferred), but basically it's worked on all batteries that could be saved. The ones that can't be saved by this procedure are FUBAR'd anyhow. Generally speaking, a "pack" dies because one or two batteries in the pack are leaking or really dead. You could just replace these batteries and fix your "pack"
This applies to mainly NiCd packs. If your device uses a SLAB (Sealed Lead Acid Battery) then you will have to make your own pack to replace this POS (SLABs aren't really good batteries. I prefer NiMH or NiCd for cordless devices). Again, this should be left to the professionals. This handheld vac has a neat filter system that doesn't require you to buy new bags left and right and you can empty out a lot of the larger solids w/o changing filters or bags. Just pop out that front piece and dump out the refuse. I bought the Black and Decker 7.2 V Dustbuster primarily to clean up occasional ashes and bark chips in front of a fireplace and secondarily for picking up bits of dog hair from the carpet. Seems like pretty reasonable tasks for a portable vacuum, right? Well, the Dustbuster did a fine job for maybe 1 or 2 months before it began its downward slide to oblivion. Then with each additional use, both the duration and the intensity of the suction decreased until there was none and the battery no longer charged at all. Unless you enjoy discarding small power tools after owning them a few months, DO NOT BUY THIS DUSTBUSTER. Upon tossing the Dustbuster in the waste can, I recalled that in my workshop were four portable power hand tools with removable, recharable batteries. So if there are other small power tools that perform quite acceptably with 12 or 18 v batteries, why doesn't Porter-Cable or Bosch or DeWalt (or any of several other reputable power tool manufacturers) build a reasonably priced, effective portable vacuum? I have been extremely happy with this product. It has plenty of power, and is very heavy duty. The filtration system, which is a new innovation since that last dustbuster model, is a big plus--the waste can be emptied without actually removing the filter. TALK ABOUT A MIGHTY MITE! We got one in 1991 and it finally died in 97. Got this one and picks up where the other left off.